I don’t write romance novels. A statement like that will get a girl shunned by some in the Christian Publishing world. You think I’m kidding? Go on to your local book store, find the “Christian Fiction” section. You’ll see a whole bunch of romance novels. Probably 75% of the books will have characters making kissy faces on the covers. Note: It doesn’t bother me that so much of the Christian fiction section is dominated by romance. If that’s what sells, okay. People like those kind of books. More power to them. And there are some fantastically talented writers who provide them with reading material. I’m just not a romance writer. But I do like to write a good love story into my novels. Romance novels are all about the…well…romance. That’s what drives the plot. 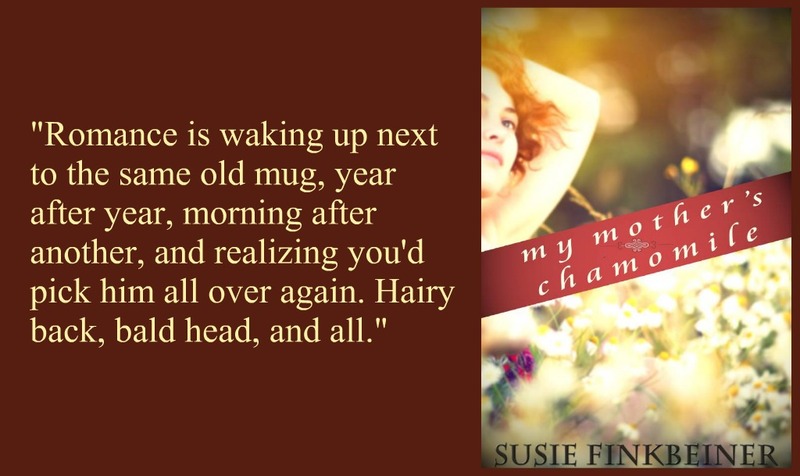 It’s what gets the characters up in the morning to spend hours doing their hair or tightening their corsets (seriously, who’s with me that we’re glad THAT fad is over…ouch!). Romance is about two people overcoming some kind of conflict to end up together. I like a thread of a love story every once in awhile. But I don’t want it to overwhelm the plot. I want it to enhance the flavor of the novel. And, sometimes, that love story isn’t about men and women. It’s about family and friends. In My Mother’s Chamomile, the dominant love story is between Olga and Clive, a couple married for 52 years. While their love isn’t new and fresh, it’s sweet and still full of passion. More than anything, though, their love survives because they choose it. How about you choose to love someone today. Even if it isn’t gooshy, smooshy face love. The guy who cut you off in traffic. Choose love. The kid at the burger joint who messed up your order. Choose love. Your coworker who is having a rough time. The neighbor who snow-blowed ALL their snow into your driveway. The child in the middle of a temper tantrum. Your husband or wife or significant other. Hairy back, bald head, and all. Today, Ashlin Jakobson interviewed me about the writing life on her blog. Click HERE to read the interview. Then hang out and read some of her stories! Great post! I heartily agree. I want a good love story, of course, but I don’t want it to overwhelm the plot. Hi there, Tina! Thanks for stopping over! Love is a major part of who we are. It really should be left out. But it’s not the only thing, by any means. Glad to have a like-minded writer friend. I don’t think I’ve ever read a true romance, but I do appreciate — perhaps even, expect — a love interest in the books I read. Without love why would it matter? Love is all you need…right? Or, really, we love because He first loved us!